Whilst the sight of so many fins on just one roof on New Year’s Day was shocking, most media attention was focused on the vast amount of fins. Yet hidden away from view in one corner was a specially constructed shack, where thousands of small fins were laid out to dry. Why were these fins hidden? What were the shark traders worried about? After three months of investigation, we now know why! 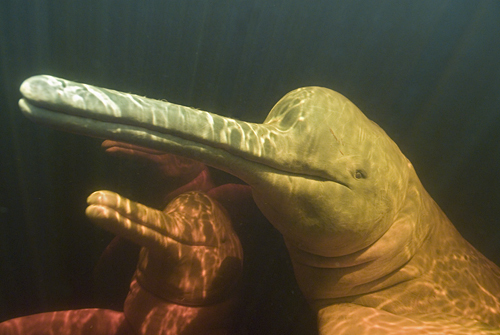 Hidden away with these fins was evidence of where they had been shipped from —Brazil. 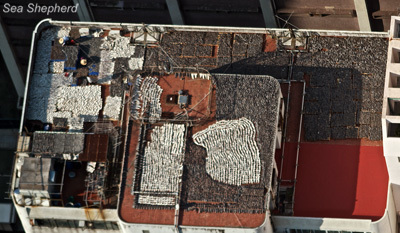 A sack with clear markings shows that this haul had been shipped by Amazon Catfish Ltd, one of Brazil’s largest seafood suppliers. 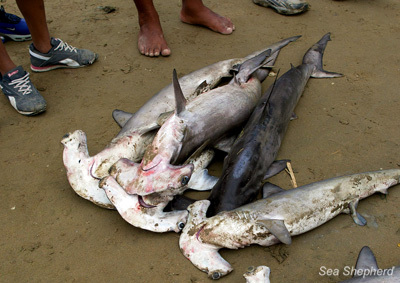 In Brazil, authorities have long been concerned about suspicious characters providing local artisanal fishermen with high-tech equipment to aid them in targeting shark breeding grounds and nurseries.Pregnant mothers, unborn babies, newborns and juvenile hammerhead sharks are being systematically exterminated along the vast coastline of Brazil to meet demand for the “baby” fins. To combat this, Brazilian authorities have implemented a law, which makes it ILLEGAL to catch any hammerhead shark under 60cm in length. Sadly, the overwhelming scale of the coastline makes it impossible to fully enforce this law, which is why Brazil has proposed to CITES to list the Scalloped Hammerhead Shark on Appendix II of the CITES Convention, because they know nothing short of a CITES listing will help them put a stop to this brutal trade. The shark fin traders know that these small fins were caught illegally, and now this could become a big problem for them!So where is the market for these fins? As Chinese New Year 2013 loomed, special menus were published across South East Asia featuring Double Braised BABY Superior Shark Fin. 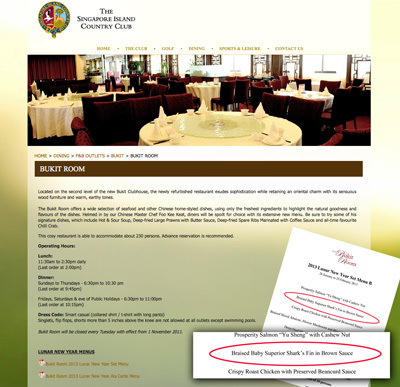 From prestigious hotels such as theMiramar Group to the elite Singapore Island Country Club, uncaring consumers are dining on baby shark fins, the next generation that will never be! 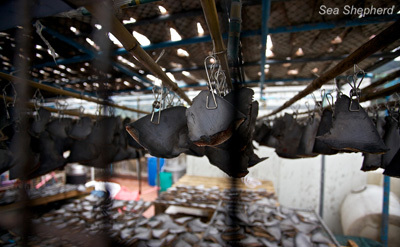 Why would shark fin traders suddenly be so concerned about illegally caught fins? They’ve been trading in them for years! Well, in parallel with conservation groups, other organizations have become deeply concerned about the international trade in wildlife, but for very different reasons. In July 2012, in a move largely unnoticed, the United Nations formed the International Consortium on Combating Wildlife Crime (ICCWC) to combat the growing threat posed by Trans-National Wildlife Crime. This coalition comprises CITES, INTERPOL, The World Bank, The World Customs Organisation and the United Nations Office on Drugs and Crime and in November 2012, Secretary of State Hillary Clinton gave an address on this issue, pledging the United States full support in bringing the criminal organizations involved in Trans-National Wildlife Crime to justice. It is internationally illegal to profit off a crime committed in another country! 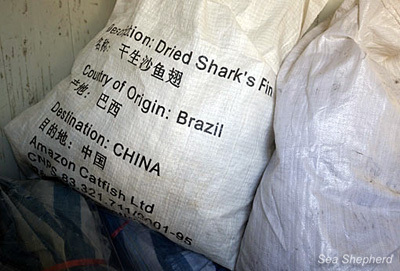 Largely unnoticed by everyone except the shark finners, because when we apply this to the shark fin trade, the parts of any sharks caught in contravention of a countries national laws become illegal if transported and sold in another country. 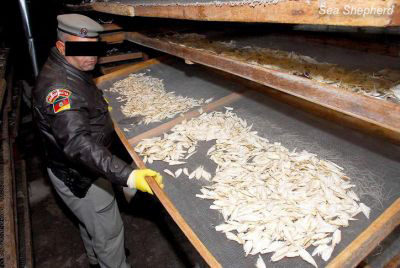 This makes the baby fins on the roof ILLEGAL, and anyone involved in their shipment, sale or processing indirectly becomes a partner in this crime. 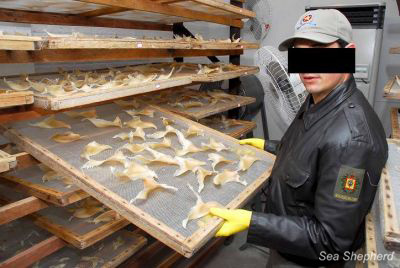 Anyone involved in this trade, from the airline or shipping companies that transport the fins, the hotels and restaurants that serve them as food and ultimately the consumers who eat them need to assess where their loyalties lie – supporting organized crime or confronting it. 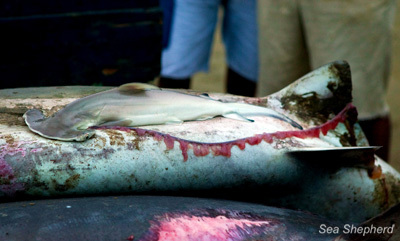 We’re not saying all shark fins are illegal, however determining the country of origin is often hard to prove, and with so many countries implementing their own domestic laws against the capture and trade of sharks and their fins, the chances are becoming more likely that fins may come from a country where they were ILLEGALLY caught. From a legal point of view,there is no quicker way to make criminals richer than by closing your eyes while helping them conduct their nefarious trade. From a scientific ecological view, there is no faster way to drive a species to extinction than by wiping out the next generation before they stand a chance to reproduce. The time has come to act. WHAT ARE YOU GOING TO DO ABOUT IT?! ~ by FSVSF Admin on 6 March, 2013.